minitest_embed.svg < 50 KB, initial resolution 1200×300 px, but can scale to anything when importing to Gimp/Photoshop or changing width height in the .svg. SH3D does not import the .svg directly so the image needs to be converted to .png/.jpg before use. Photoshop can read and generate 3D models, and of course scale 3D models up or down, but textures ( photographic images) can not be up-scaled by any program without loosing quality, whether it's in .svg format or any other format. The way I understand it, using the .svg format has advantages only when using scaleable vector graphics. The .svg format is not read by Photoshop, so I use Adobe Illustrator to scale and convert it to .tiff or .psd whenever I get a file in that format, since I only work with photographic images. Personally I struggle with using Gimp, but I put that down to having used Photoshop for nearly two thirds of my life, and me being frustrated when none of my "normal" shortcuts are working. I still don't see how .svg makes it easier to edit. Oh, easier I do not know. A wise woman once wrote that the key to mastering software is to study and learn the short-cuts. Easier and quicker, I suppose, is always the interface you are used to. For me there are two issues. Interface and format. While the Gimp is brilliant for raster graphics in general, I never liked the interface for layers. Probably noting wrong with it, I just do not like it. That calls for a format where it is possible to switch between different software to do different things. Using Photoshop or Gimp formats locks you in. Yes you can interchange .psd and .xcf, but unreliably and at the risk of loss. In addition to being an open format, .svg has a couple of advantages. It opens in browsers, the Gimp, Inkscape and any text editor. But even better, I can open elements (clouds, sun, mountains) individually in the Gimp, while at the same time keeping the .svg (with links) open in a text editor and Inkscape. Especially since I also use .svg elements (sun path, mark satellites) the combination lets me use the best format and best interface for each element. Want to place a cloud behind the mountains? Just swap the two lines in a text editor. Once all elements are in place, I export to high-resolution with Inkscape (or the Gimp will do nicely by importing the .svg at high res). Is this easier? It is for me. But only because I feel at ease with the functions I preform in each program. Could I do everything in the Gimp? Yes, but it would take me longer. Maybe an awkward way of working, but one I am used to. And a flexible one. 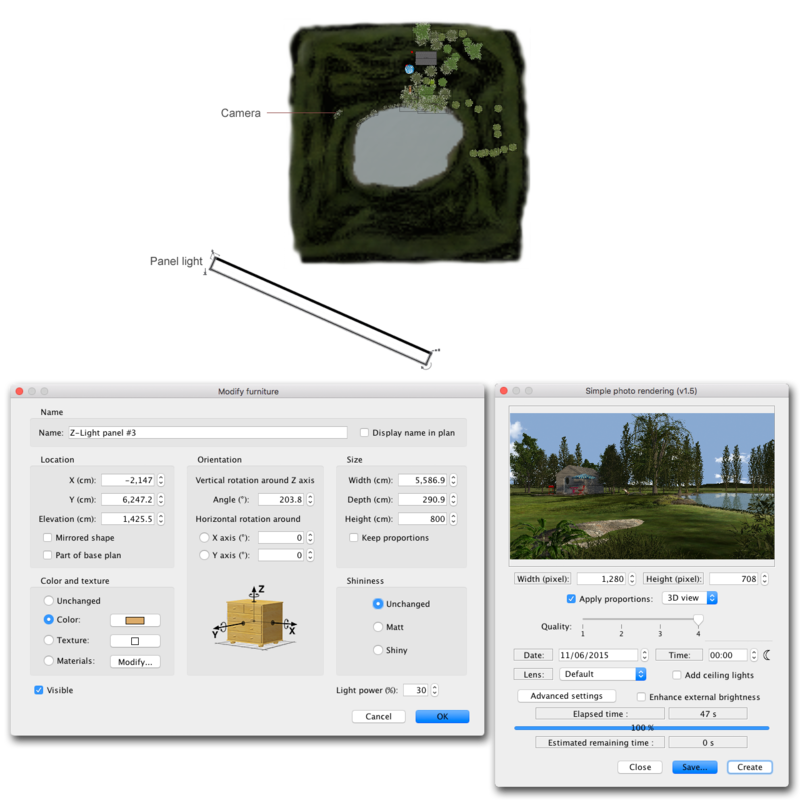 SH3D lets you do almost everything from within the interface, but sometimes you need to add a cut-out or change a window sash. Just open Home.xml and fix it. Not that straightforward, maybe, but a lot faster than going via the Furniture Libraries. But when I posted the template as .svg, it was mostly because it will edit with different pieces of sofware. .png/.jpg would not have preserved layers / different elements. Using Gimp .xcf would require the user to be familiar with the Gimp and so on. 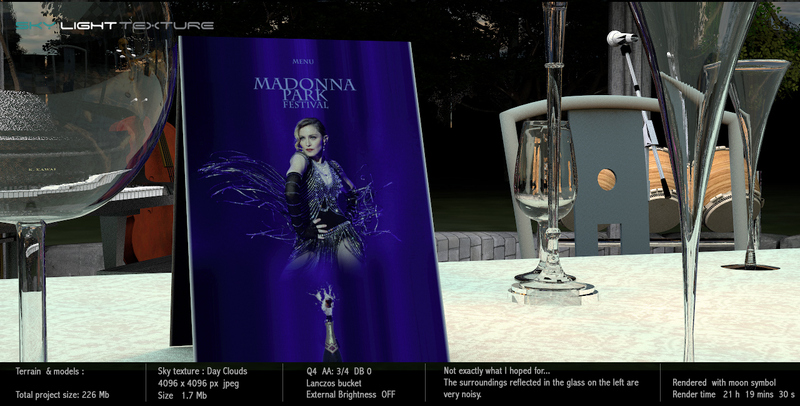 and when IBL-lighting vas introduced shortly after, we got yet another major lighting improvement. 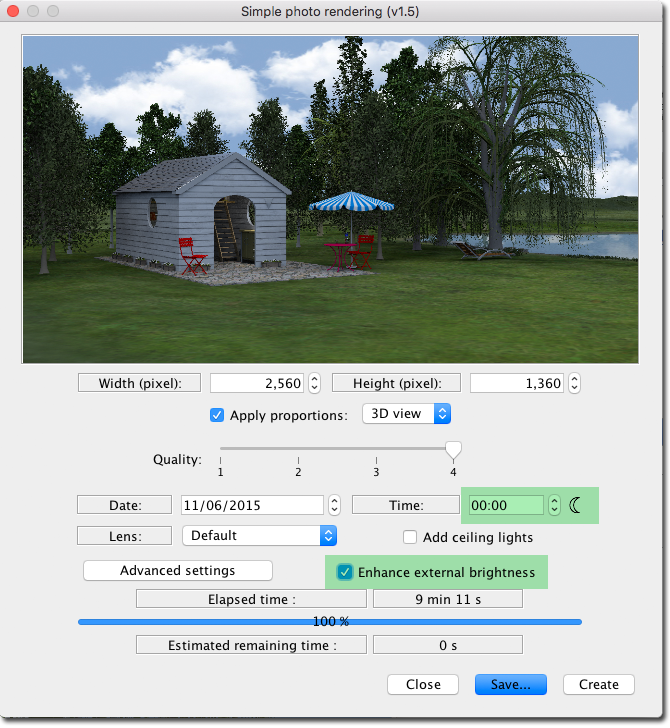 And then we got the resizable render window, an invaluable tool for checking our light settings fast and easy. Recently Enkonyito has introduced the panel lights – which have once again lifted SH3D to a new level. 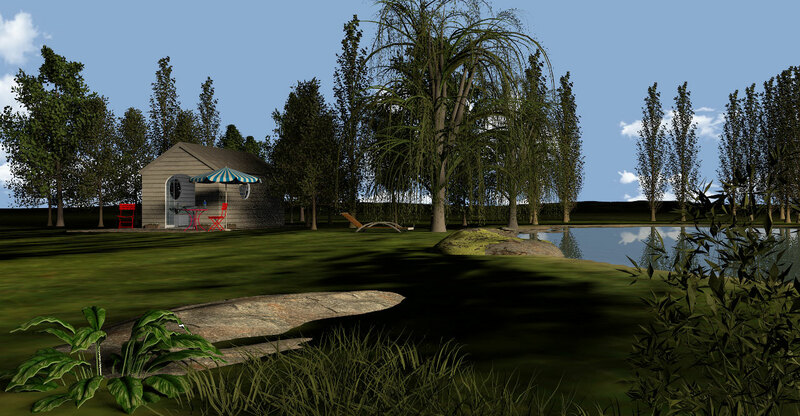 Now Sweet Home 3d v6 is just around the corner. I'm going to play with panel lights in this post. 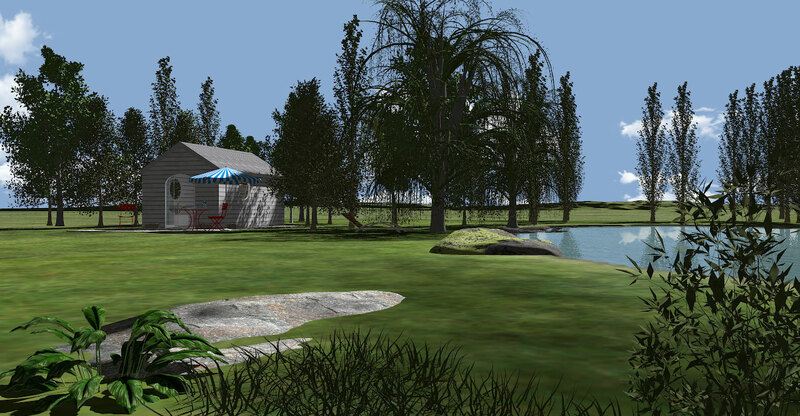 First I will work with SweetHome3DExample9-WoodenShed.sh3d from the gallery – a project file weighing only 13.4 Mb. I have chosen this file because it is very small, yet quite detailed and with a focus on the surroundings. I will only deal with the exterior. The plan is to make some nasty modifications to the project and create a file that is a lot bigger. 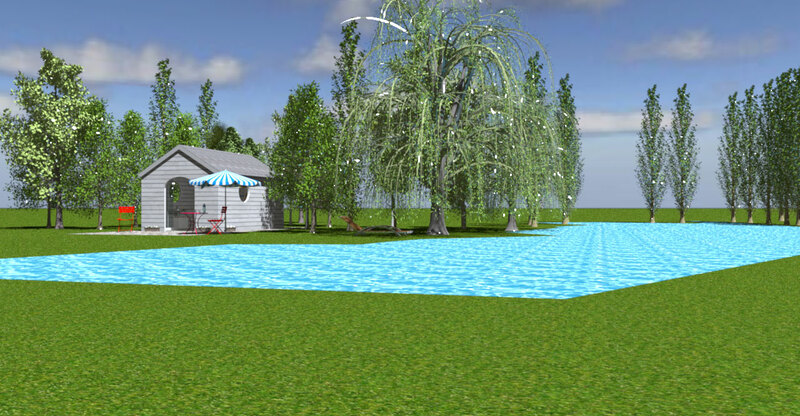 The first thing I will do is to delete the water and add a slightly sloped terrain with an immersed pond at the highest point. That will increase the file size with some 100 Mb. Then I will add a ground texture and a sky texture, some gras, stones, plants and so on, plus a terrain to cover the horizon, which will add another 40 Mb. Then I will work on the trees. I will keep them at their current position, but I will add textures to the leaves and get rid of the shininess that's always present in these models. There's a lot of trees, so that probably adds another 30 Mb to the file size. I will also add two new levels: One for the terrain ( at ground level ), and one for things that shall stick up from the terrain, like stones and plants. Then I will elevate the two original levels by what's necessary to make the house level match the height of the terrain. At last I will add a high-res hemisphere to cover the entire construction, but I will keep it invisible until I need it. 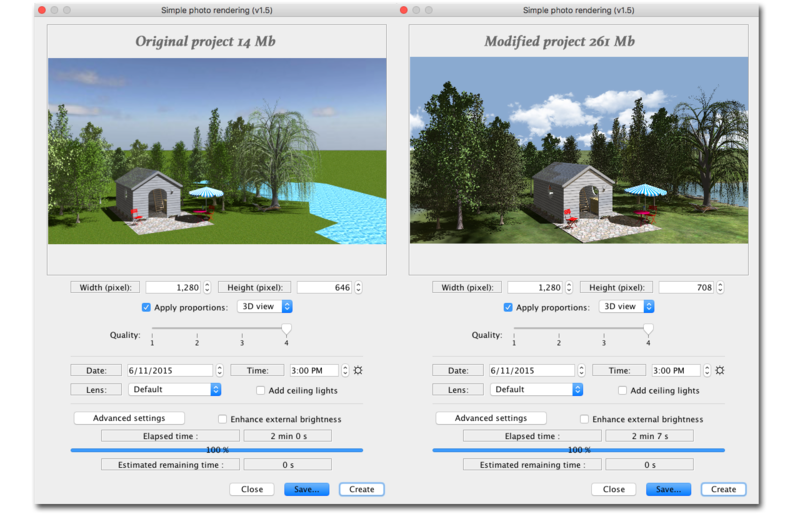 This project is made with Version 6 beta 11. It might not render snapshots when opened with older versions. Everything I have added is marked with a "Z" in front of the name, and will naturally come at the end of a list sorted by name. The "Z"-marked models are my creations. Feel free to grab anything of interest. First I will add an orange panel light to substitute the sunlight, and set the time to midnight. Using a light panel to substitute the sun obviously gives a lot of new lighting options, but what if I place a hemisphere over the entire construction? 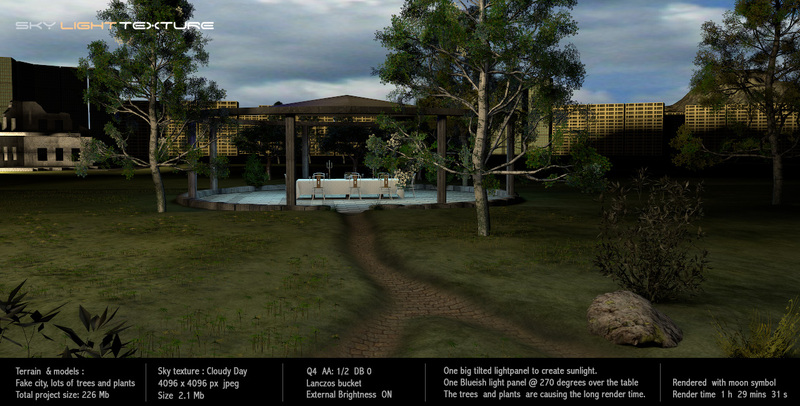 ...and create moods and atmospheres that I sincerely doubt can be created this easily with any other 3D program. Ahh, yes; what about the rendering time? One advantage of using light panels for sunlight, is that you don’t have to adjust the compass to change the direction of the sun. and rendering with light panels is a lot faster than with the original light sources. The following snapshots are results of my first experiment with the new light panels. 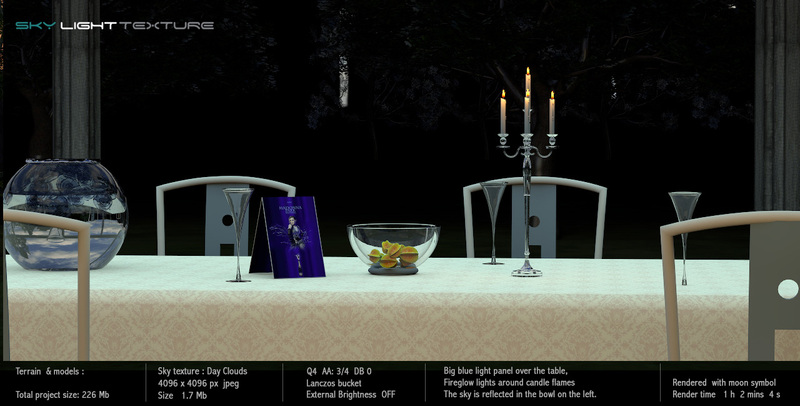 They are all rendered with no sunlight ( moon symbol), and I’m only using light panels. Bigger and closer light sources give softer shadows – smaller and farther light sources create sharper shadows. And just as when using light-filters in real life, variations in the light intensity will alter the effect of the colour-settings. It’s useful to have the right filters when blending the new light sources with the sphere lights. The filter temperatures for some of the most used sphere lights that comes with the program can be found here. Make a note of the RGB-values – never use the eyedropper to sample colours from SRGB jpgs. In part four I will show some examples and write a few words about creating textures. Whaouh! Thank you Ceciliabr to share all your secrets! 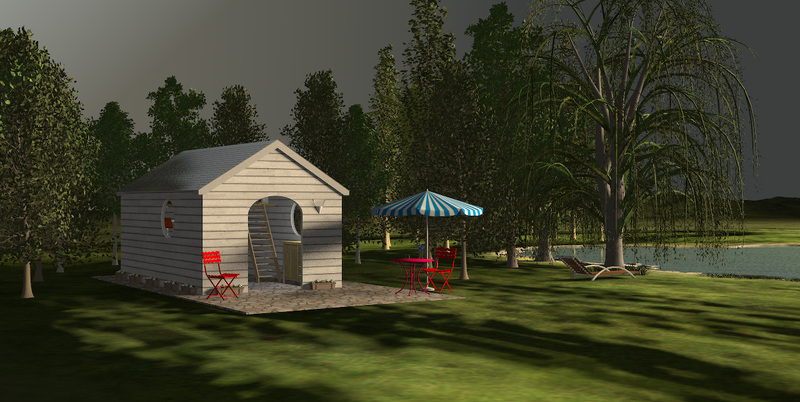 Thank you Cec, for these tutorials, fascinating so far and looking forward to more. Out of curiosity do you know if the is a setting for non directional light, i.e. no sun just an all over even light so that no shadows at all are created? do you know if the is a setting for non directional light, i.e. no sun just an all over even light so that no shadows at all are created? 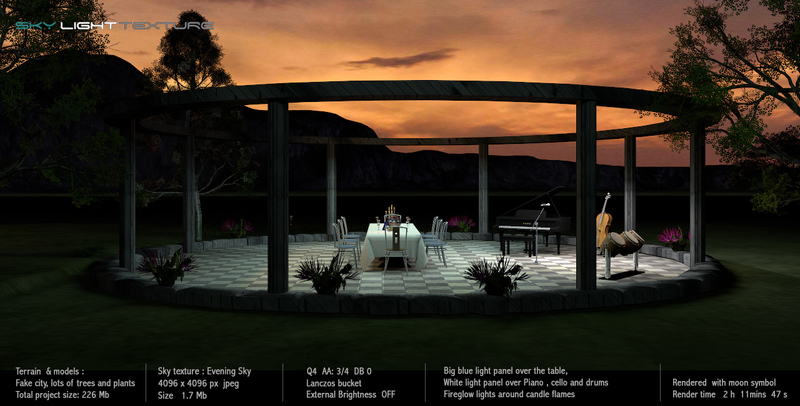 When you select Enhance external brightness , Sunflow will use the sky image as a light source (Image based lighting – IBL. If you set the time of day to midnight, only the light from your sky image will be used to light your image. If you apply a white texture ( not colour ) to the sky, your image will get a neutral tint. IBL will increase the render time. You seductress!! For close to ten years, I've been happy using my "cloudy sky" as the universal texture for all my photo renders. Now, I feel tempted to stray into the unknown, but oh-so exciting, world of light and textures. Thank you for broadening my horizon and making photorealism attainable for the illiterate. A big thanks to you as well, for explaining the art of horizon-scaping. Oh master of the dark art of programming, thank you for making all this possible. [...]to share all your secrets! Everything I know is based on information given to me by generous people. Here we are given this wonderful program for free. What sort of person would I be if I didn't try to give something back? Sorry to say, but I have just been a leecher so far.